Jenna knew from a young age that she wanted to work with animals. Her rescue dog died suddenly from a growth on his heart, ever since she knew she wanted to do whatever she could to help them. She grew up in Kenosha, WI, her parents divorced when she was very young. He father remarried a veterinarian, which helped inspire her to pursue her career working with animals. 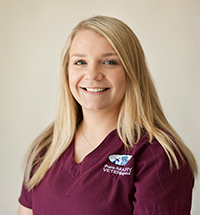 Jenna enrolled in college in 2014 to earn her Veterinary Technician Certificate. She enjoys helping client’s pets through all of the unique health issues they face and assisting with surgeries and continually learning. She lives in Racine, WI with her 3 year old son Carson. She has an 8 year old pointer hound mix that is a stereotypical grumpy old man. She enjoys hanging out with her son and family during her free time. Jenna says that son was definitely the best thing that ever happened to her, he pushes her to do her best!